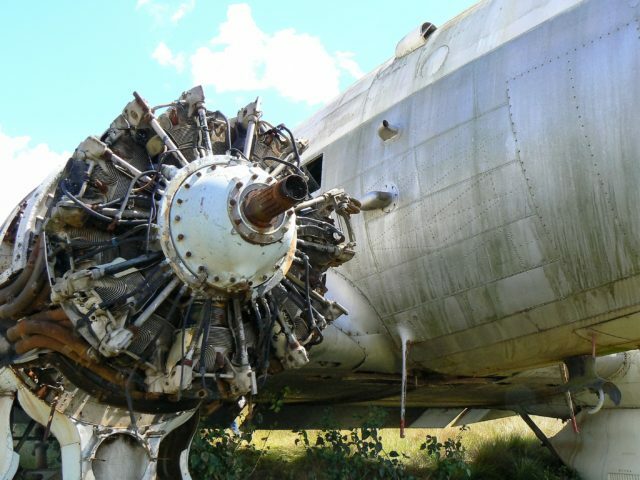 In this DAKOTA HUNTER BLOG, you will read and see photos of yet another Aircraft Boneyard that existed for years in Madagascar. In one of my previous Blogs, I wrote about the Greek Boneyard (c.q. Museum) that still exists with a collection of a Junkers Ju-52 3m, a Stuka, an F-104 Starfighter and C-47s. A weird mix of German and American aircraft. 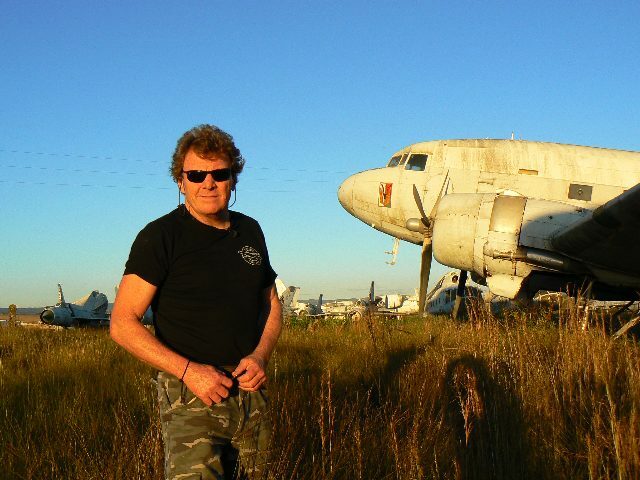 This Blog, however, is about a Boneyard with a mix of Russian and American aircraft that I visited some years ago with my friend Bart Nopper. It took place on that huge Island of Madagascar, 300 miles east of Africa in the Indian Ocean. The photo above; As the Dakota Hunter I found a good reason to go to Madagascar. 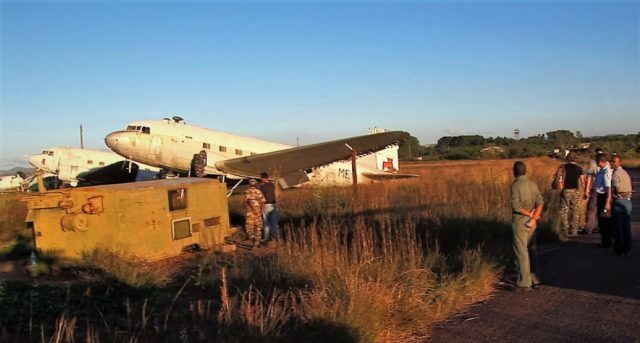 On behalf of my trade, I kept looking for derelict DC-3s/ C-47s in order to salvage parts and cockpits of aircraft that were otherwise too far corroded or stripped to justify a complete airframe salvage operation. The transport costs for a fuselage, tail, wings and complete central wing section with engine nacelles were expensive from this mid- island airport, due to its far distance from a seaport. We found out that the transport of all 5 DC-3 aircraft in that yard was likely to become a cost-prohibitive operation, so we skipped that option. But when we saw this aircraft behind me, we had to think twice. This ex-French Air Force Dakota was in good shape with engines and props still in place, she came from Vietnam and had possibly participated in the Dien Bien Phu Para dropping support operations in 1954. That could mean that this particular aircraft had a special added value for Museums, always in search of specialty aircraft with a documented Hero-Role. 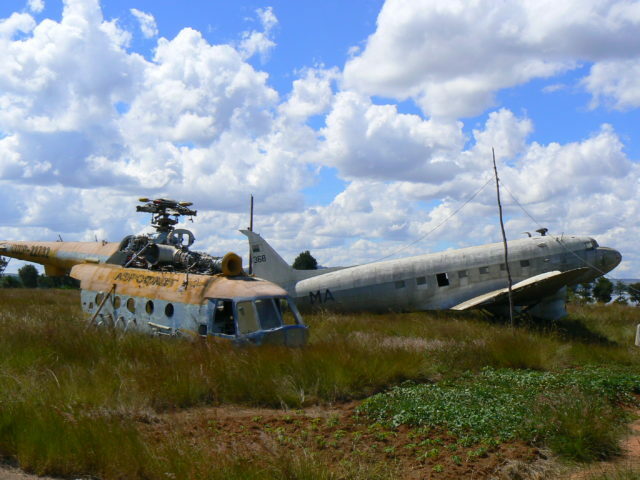 The photo above shows the unique collection of derelict Military Transports and Fighters on the Madagascar Air Force Boneyard. With a Douglas C-47 in front, Antonov An-24s in the background and a Russian MIL helicopter at right. The reason I went there was by itself pretty weird. I was contacted by a local man who came to warn me by email for an impending little disaster on that huge island, 300 miles east of Africa in the Indian Ocean. He had found me on the Internet as being “The Dakota Hunter” and as it turned out, he needed my help in the salvaging operation of the surplus aircraft that belonged to the Malagasy Air Force (MAF) for which his father had worked since 1960 as Chief Mechanic. I arrived in Madagascar with my friends Bart Nopper and Cameraman Axel Ebermann, as I sniffed to make some interesting footage out there in that Tropical Paradise Island with 20+ derelict War Birds scattered over a swampy terrain. But whatever we had in mind for doing a salvaging job, the political and military rivalry on the island completely paralyzed our intended operations. Instead of hoisting and wrenching to get the wings off the C-47s, we arrived from Day One in a bizarre labyrinth of intrigues and were sent from one Colonel to the next one in what can best be described as a huge scam. Photo above. The legendary Pratt & Whitney aero engine R-1830 Twin Wasp, air cooled with two rows of 7 cylinders placed in a radial configuration around its crankcase. Note the architecture of this masterpiece of US Industrial Design that made one of the most reliable piston engines ever produced in the 100 years of Aviation History. Its 14 cylinders have a displacement of 1830 cu in (30 liters) with 1200 HP max output. Over 170.000 built, this engine propelled the 2 most produced aircraft ever built, the legendary DC-3/ C-47 ( some 16.000 built incl. license builds in USSR and Japan) and the Consolidated B-24 Liberator (over 18.000 built, including 8.000 by Ford) and is with that the most built aviation engine ever. My book The Dakota Hunter engagingly describes the chaotic, threatening or intimidating and sometimes even hilarious events that followed. The chapter is named: “Dancing with Colonels” and that is a mitigating title for describing the way we were being tossed around in a potentially explosive relation between the Military, the MinDef (Ministry of Defense) and the President of the Republic. 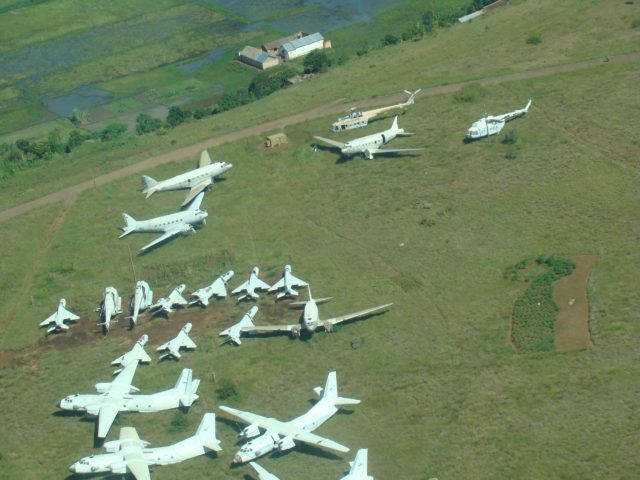 The photo above shows the Malagasy Air Force Boneyard in a bird’s eye view. This strange array reflects the switch that Madagascar made in its political preferences since its independence from French Colonial Rule in 1960. 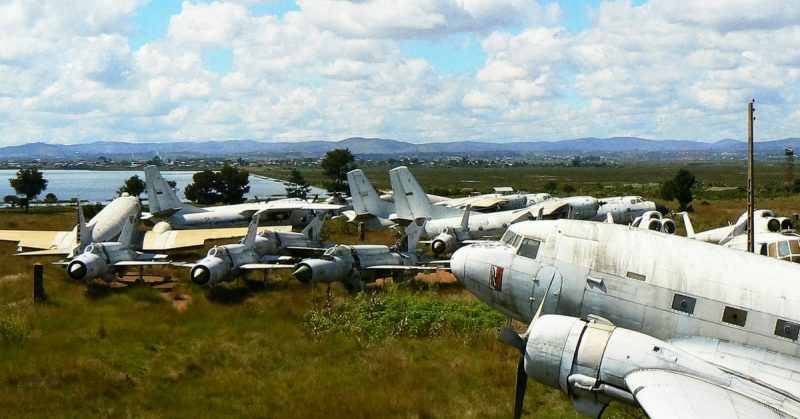 Aircraft from both the Western and the Eastern Military camps of the Cold War are peacefully united as “Brothers in Arms” on this boggy field just outside the International Airport of the Island´s Capital Antananarivo. But the reality was not so peaceful as in this picture, and we would soon find out. This blog format does not allow me to fill you in on all details, but you must believe me as I tell you that we had an experience like we were actors in B-film. We started with a viewing of the derelict aircraft in the Boneyard under the personal guidance of a cunning Colonel who was the Commander of the adjacent Air Force Base. That Colonel was willing to discuss with us the purchase of the five C-47s for a salvage operation before it would all go down the drain under the cutting torch according to my local guide, but that was strongly denied by the Colonel. He talked about Museum grade artifacts but tried to lure me into a very tricky deal. In exchange for the total boneyard (over 20 aircraft, virtually all that was left of what once was the proud Malagasy Air Force), he wanted me to deliver him a flying twin-engine Piper Navajo from South Africa. Wow, what was that for? The next day, we arrived at the MinDef and tried to make a better deal with the Minister directly but were almost arrested as they heard rumors about that Piper Navajo proposal. In their twisted relations, the Minister saw that plane as a “getaway” or escape aircraft for the Colonel who was a suspect in the never clarified bombing of Presidential Palace a year earlier. Are you still there? The photo above: After having made our inspection tour over the Boneyard, we came to the inevitable final act: striking a deal. You see me at right (in black T-shirt) deliberating with the Colonel and his Staff, but he refused to give us a price right there. For that, he took us apart to this office with no one of his Staff around! The MinDef Dept. was filled to the brim with conspiracy theories, they saw me suddenly as a possible “Agent Provocateur,” trying to help to stage yet another bombing raid on the Presidential Palace with an illegally flown-in Piper! I must have said something in French as “Have you all gone Bananas here? There is no Piper!”. But that was no good idea as my French with a heavy foreign accent was prone to some misinterpretations. Whatever, my local friend started trembling all over, thinking we would all end up in jail or in a labor camp for the illegal import of aircraft, conspiracy against the State and offensive language. But it was not that bad, I explained that the Piper was never offered or brought in by us, only asked by the Colonel. That man had obviously some good reason to get away from the problems that he himself had inflicted. Detail Piquant: “Monsieur le Colonel” was not the owner of the Boneyard Aircraft and not authorized by the Minister to deal with me about the sales and price! The Ministery surely had a point here, we firmly agreed with them (yes, that makes friends) and I promised from here to deal only with the MinDef. We shook hands as sworn friends and were instantly released with a hug or two, ha. The photo above: This Russian Mil Helicopter was another empty shell, totally stripped from all sides, only the letters “Aeroflot” seemed hard to be removed. Surely cannibalized for spare parts to keep the other types flying, as also happened with the Douglas DC-3 in this picture. It ended up with only one last aircraft of each model flying until the late 1990’s. The President of the State was not from the Army or Air Force but elected as former Mayor of the Capital. You may have thought; Why the heck didn’t they send in a special Delta Force to that Air Force Base for arresting that Colonel and court martial him, simple. But that is not the way it goes out there, not so simple! He was a Colonel and sort of independent Warlord all in the same person. If you thought such could only exist in hefty Video War Games, well, read my chapter. While the people from the Island were most friendly and helpful to us, it was only a couple of Military Colonels and some high-ranking Government Bozos who make it messy out there. Corruption is the curse that reigns in many countries and often can settle for too long before political cleansing mechanisms start to remove that trash from society. With the Military, it is even more awkward as they have the exclusive claim on weapons and can intimidate accordingly! 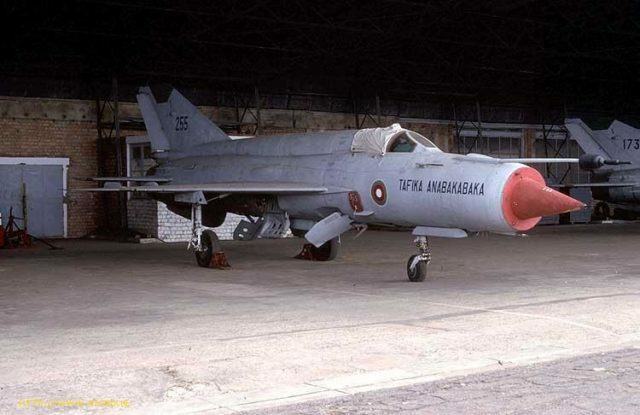 The photo above; The Malagasy Air Force Mig-21 was the bait that brought the USSR in as the new Messiah in Madagascar. While the French Government only wanted to give some vintage WW II built DC-3s/ C-47s to the fledgling Democracy, there stood up often a General, Colonel or Admiral who had higher aspirations to make Malagasy looking Greater than ever. The Mig-21 gave status and allure for the Eye of the World, but one could wonder what function such complex and short-range interceptor could have on this Island, 300 miles away from its nearest neighbor. But those were typical “Western” critical remarks, the Russians did not care for such considerations and delivered a dozen or so of Supersonic Fighters that were hard to be kept operational, due to lack of spare parts, trained pilots, and support crew. Only on Independence Day, they flew 6 of them in a low Fly-pass over the Grande Allee of the Capital. The Army’s Top Brass and President (often bitter enemies) shook hands for the success of such Power Demo and while the Migs barely made it back to base, they went straight back into servicing for the next year’s show. The trucks and tanks of the Army had that same constrained operationality, but on that Independence Day, it should all work alright. Hilariously, the final attack on the Palace (a sort of a national bi-annual habit by now) happened this time with three armored cars. Hélas, on their way to the Palace, 2 of the cars ground to a halt, due to mechanical failure or running out of fuel, one made it and crushed the gate. The president was warned and managed to flee the country to SA with that private Jet, paid by himself and the State. The purchase of that US $60 million Luxury Jet was the final spark for the Army to oust him. It surely was not a smart “buy”, in some other nations we see similar excessive spendings of the Head of State. Amazingly, any sane person would feel the foreboding that trouble is on its way but “the Arrogance of Power” is a hard to cure disease. In previous years traveling the world in search of the lost Dakota, I had some pretty weird confrontations with the Military and with Warlords in particular. Years ago, I came to the Northern desert of Nigeria, in a town named Kano and once during a trip to South America via the Western Sahara in a town named Nouadhibou. Unwanted but “invited” by the local Power Macho, I ran into ghastly situations like what you see in the photo below with unwieldy characters. Note: This is not a photo made by me, it surely would have cost me my camera or worse. The photo above: Strange ENCOUNTERS with WARLORDS. 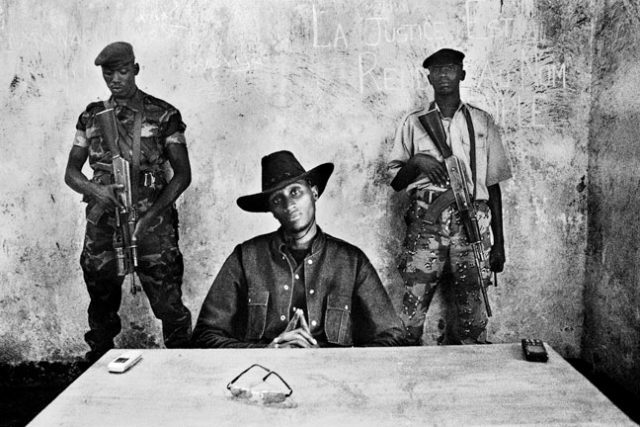 Worse were the rare encounters with Warlords, often “gangsters in disguise” with armed and uniformed “soldiers.” Sometimes playing it the hard way and trying to intimidate me, haggling to get money for ‘protection’ against idiots like themselves! That game was mostly part of their Theater Act, but you could never tell where the acting stopped and the threats started. My book is no handbook ‘How to deal with Scumbags’, but I give some clues. Surely, that is no invitation to try this out yourself with those “Papa Doc” characters and their sinister militiamen. I guess many of them have a mental problem and are prone to violent Mood Swings. A kidnap is never far away in countries where money is short, but with lethal weapons galore and no Law enforcement around in hundreds of miles. I was lucky, thanks to local helpers who also cost me some money, but they warned me upfront where to go and not to go! As you read this Blog of mine, that is the best evidence that (by good fortune for sure) I could maybe stay one step ahead of them in order to get out of their territory in time and once back home, I could write my book. We have come at the end of this Blog. You may have a few questions left, like “How did this end?”. Well, it ended as everything out there in a total and never imagined Madagascar Disaster. Read in my next Dakota Hunter Blog “The Madagascar Massacre” how this ended in a tragedy, with intrigues, scams, and blunders inflicted by the very chaotic political turnover that followed after we left the island. It reads like a horror film scenario. While in our Western World Mass Media, there was hardly any news about what happened out there, the world turned grim for most inhabitants of Madagascar with the disastrous drop in Tourism and Investments from abroad. Stay tuned; there is a lot more to come and in the meantime, see below the cover of my book and how to order it from Amazon with one single click. Photo above : My book’s cover. Christmas is now less than a month away. If you still try to figure out what might be a good Gift for your Dad, Husband, Uncle, Friends or yourself, well, here is a proposition that fits them all. For direct Ordering & 5-Star Reviews at Amazon, click here and you’ll land on the right page. Come to my website www.dc3dakotahunter.com for more details of my Book & Blogs or ordering an autographed copy of my book. Sharon Perry: WONDERFUL STORY & GREAT BOOK – I VERY RARELY BUY A BOOK but I may invest in a few of Hans for all the WWII history & Douglas buffs. I’ll keep one for myself of course – to read over again for the history of the world thru the eyes of one who made the most of his life during these times. CONGRATULATIONS! 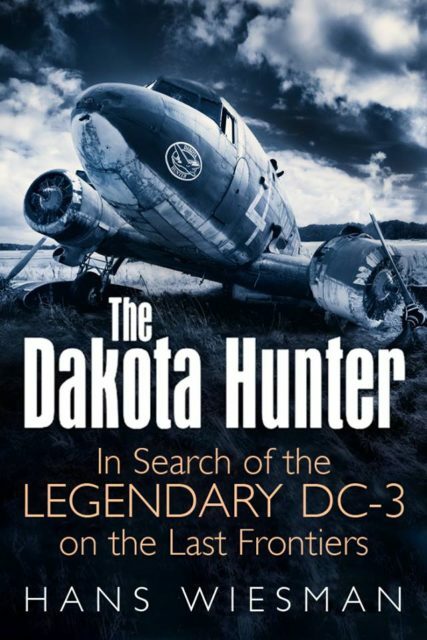 Ciro Attardo: I thoroughly enjoyed this book, and especially appreciated the numerous photographs that accompany the stories of adventure and discovery as the Dakota Hunter traveled the world in search of DC-3 aircraft and parts. Anonymous: A brilliant story of a man on a mission to track down the whereabouts of these old aircraft whether decommissioned, wrecked or still flying. He takes you to parts of the world where most tourists would not dream of visiting. A very well written read.